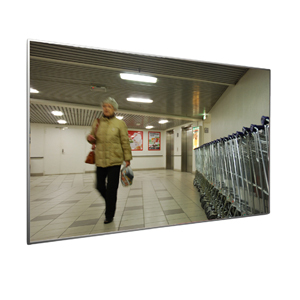 The IP flat mirror is versatile in retail or department stores to protect against shoplifters used. The brilliance of the mirror image allows the employee a quick overview. The mirror is made of impact-resistant acrylic (70% stronger than glass) and is mounted in an aluminum frame. The IP mirror can easily be attached to the ceiling (sold separately) or to the wall using chains.